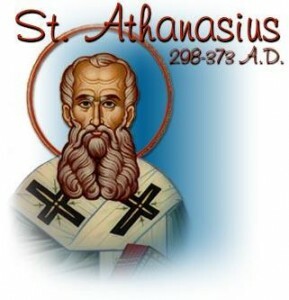 The Parish of St. Athanasius was formally established from a mission in Lanark in 1849, probably on the Feast of St. Athanasius – 2nd May. As the number of Catholics in the area increased it became necessary to establish new parishes. St. Athanasius then became the mother-parish of many parishes on this side of Lanarkshire, including Newmains, Shotts and Biggar. We are the 4th oldest Parish in the Diocese of Motherwell after:- St. Margaret’s Airdrie (1836), St. Mary’s Hamilton (1839), St. Patrick’s Coatbridge (1842). Mass was celebrated at various locations until the first Permanent Church building was opened and Blessed on Sunday, 13th September 1857 by Bishop Murdoch with Father McCay being appointed the Priest-in-charge. In 1863 the present Presbytery was completed and when Father Cassin the “Priest-in-charge” vacated the old premises at the rear of the Church it became St. Athanasius’ Primary School for a short time. Due to an increase in Parishioners the Church interior was renovated and remodeled in 1957. Barely 25 years later, however, the Catholic population of Carluke had more than doubled. Even with 3 Sunday Masses, the existing Church was unable to cope with the number attending. In 1983, only one year after arriving as Parish Priest, Father McCarthy embarked on the mammoth task of extending the existing Church retaining as much of it’s character as possible This was successfully accomplished, and Bishop Devine performed the Solemn re-opening and Dedication on the Feast of St. Athanasius, 2nd May, 1984. Since then our parish has gone from strength to strength, celebrating it’s 150th Anniversary in 1999. We are one of the few parishes who can boast an increase in the number of people attending Sunday Masses in the Census taken in November 2003. In the year 2000 Fr. James Naughton became our parish Priest and progressed further building developments. After nearly seven years of fundraising activity and with the support of the local community and the South Lanarkshire Council Renewable Energy Fund our new St Athanasius Community Hall was ready to open its doors in October 2007. Welcoming the opening of the new hall Ronnie Cook, our then Chairman of the Hall Management Committee, said “We are very grateful indeed for the goodwill and continuing support from parishioners and people in the town particularly in this last year or so as the building work has been going on”. Some time later the brickwork of chapel house was re-pointed.